2 Bedroom Apartment in the center of one of Anglesey’s popular seaside towns – Benllech. The apartment gives easy access to all the facilities Benllech offers plus walks along the beautiful beach. The entrance takes you into a spacious lounge – recently decorated with brilliant white walls and a new grey woven carpet. A step from the lounge gives access into a large modern kitchen / diner fitted with matching wall and base units and grey slate design cushion vynyl flooring. 2 x large bedrooms recently painted and new grey woven carpets fitted. 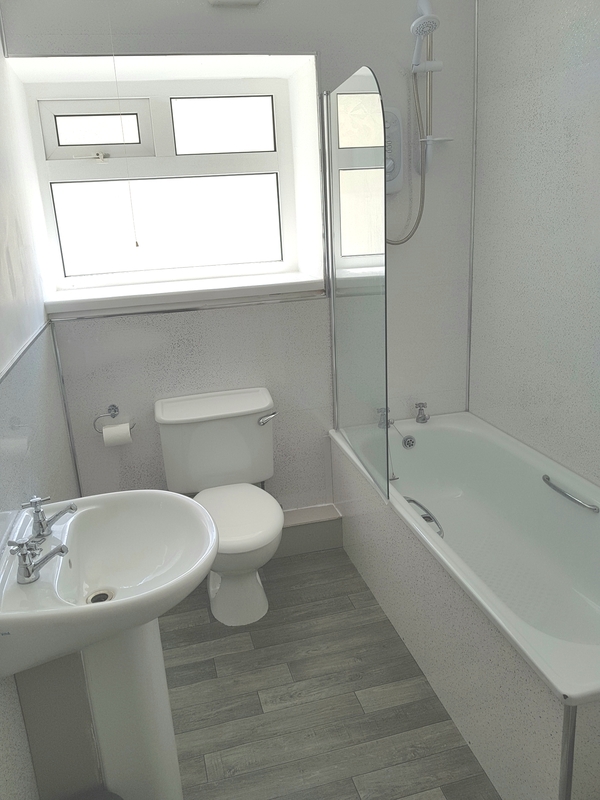 Family bathroom with: w.c. / wash hand basin / bath with electric shower above / cushion grey slate design vynyl flooring. The apartment is double glazed throughout and offers electric storage heating. There is off road parking for 2 vehicles. This apartment idealy suits a single or professional couple. DSS considered (subject to status and being able to provide a suitable guarantor). Successful applicant / s and guarantors will have to complete credit / reference checks and have a final interview with the Landlord. Usual terms : 1 months rent in advance / deposit and agency fees apply.